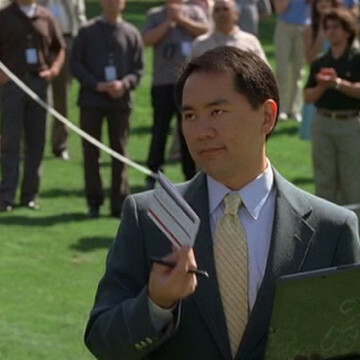 The part of the club official in S06E05 of Entourage is played by Keisuke Hoashi, an actor and writer of Japanese descent. When Jeffrey Tambor turns in a scorecard that claims he’s set a course record, Hoashi’s character grows suspicious and asks Ari to verify his client’s score. In addition to Entourage, Hoashi has played small roles in iCarly and Mad Men and played the lead part in Onizuka, Kona’s Son, a 1998 musical about astronauts.